1. They’re opening up the weapon slots. Yay, combat will be fun again and more diverse than it has ever been. 2. The new game mode Gambit, this sounds like something I will sink hours of my life into. It has the potential to replace raiding for me as my favorite Destiny activity. 3. The new raid. They’re turning a whole patrol zone into a new raid that will be changing up on a weekly basis. 4. New subclass paths, they’re not letting us customize our guardians but at least they’re giving us more play style options. 5. Random rolls are coming back to weapons. This will lend some relevancy to loot instead of just dismantling everything you get. Bungie dropped a lot of news this morning concerning the future of Destiny 2 and the Destiny franchise itself. 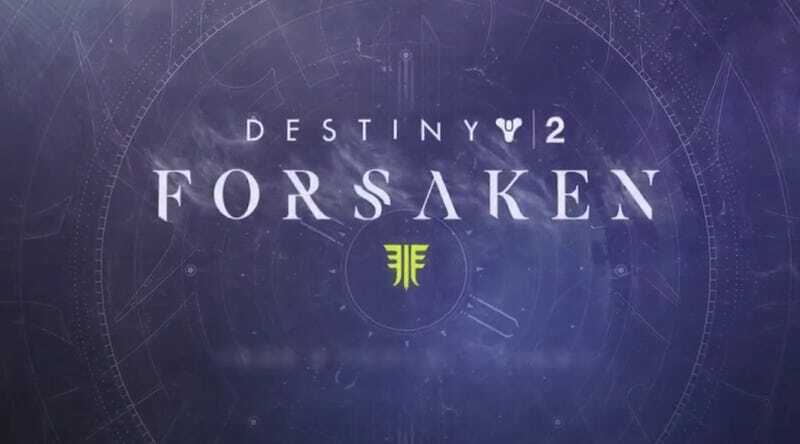 The new expansion is titled Forsaken and will be coming out this Fall. Bungie has been teasing the new expansion for quite some time as well as other changes to the base gameplay of Destiny 2. You can watch a recording of their live stream on their Twitch cannel, twitch.tv/bungie . - Weapon slots are being opened up, they teased being able to equip 3 shotguns if you wanted to. I’m not sure how this will work with exotics. - New subclass paths, which also debuted some new supers for your guardians. - New mod system and perks being added to armor. -Collections tabs for any and all items in the game, weapons, armor, shaders, emblems, etc. - Random rolls for weapons are coming back. - Quickplay in Crucible will now be 6v6 permanently, Rumble will be a permanent play list, and competitive will stick with 4v4. - Power level will matter in Iron Banner and Trials again. The higher your power level the stronger you will be. - They are ditching DLC expansions after Forsaken, or at least for the rest of Destiny 2 Year 2. Instead they will be selling a Annual pass which outlined 3 big drops of content, seemingly to coincide with each season of play. - Forsaken DLC plus the Year 2 Annual pass will be $70 and you can purchase it now. It is also required that you purchased both DLC’s from year 1 to purchase Forsaken. For those of you that didn’t I’m sure they will release some type of a “complete” collection that will include everything. Those are baseline changes coming to Destiny 2, I’m assuming this is coming to all players regardless of having purchased the expansion. Now here is some info on the Forsaken expansion. - It looks like we are going to be able to go back to the Reef, which was a social space in Destiny 1. It will also feature a new patrol zone based on the Reef. - The story premise seems to be based around a jail break from the Prison of Elders, which was a Destiny 1 game mode. - Of course there will be new loot, they showed off a new weapon type, bow and arrow. - There will be a new Raid, this time however the Raid will be its own entire location, similar to the Leviathan Raid. I believe the intention here with the new Raid zone is to also have it act as a Patrol area for high level characters. They also said every week it will switch up and be different, maybe like the infinite forest? - There is a brand new game mode coming called Gambit, it will be accessed through the director just like strikes, crucible, patrols, etc. Gambit is a mix of PvE and PvP. Essentially there will be two teams of 4 facing off against enemies in some kind of a horde mode. You’ve got to feed items into a bank for your team that drop from killing enemies. Feeding items into your bank will spawn a big enemy for the opposing team which also stops them from feeding items into their bank. Teams will also have to option to send 1 player from their match to invade the other teams match, invading will allow you to kill the opposing players or hinder their play. The enemies will be a mixture of smaller enemies to bosses. The annual pass it seems will be a way for them to constantly give us new content. There are three drops you get with the annual pass spread through out Year 2. Essentially it seems like they won’t be dropping new story for us with the annual pass like we got in year 1 with Curse of Osiris and Warmind. Instead they will focus on loot and updating game modes, or that is at least the impression that I got. I’m excited for the new expansion and changes coming to Destiny 2. I think they are addressing most of the issues currently plaguing Destiny 2. It’s too bad it will end up taking them a year but I think come Fall we will all have the game we wanted. I don’t know what to think yet about the Annual pass, honestly I think we will end up getting less content than we got with the 2 DLC expansions for Destiny 2 in year 1. Bungie has promised more details to come through out the summer, we can expect more info at E3.